Our World Famous Miracle Gel, manufactured with the finest pure Aloe Vera and Seaweeds, is a unique cellulite treatment gel which contains Aloe Vera, Comfrey, Eucalyptus, Irish Moss, Japanese Green Tea, Chamomile, Bladderwrack and other special ingredients. This special formulation has been found to help rid the body of cellulite and smooth out wrinkles that form as your skin ages. 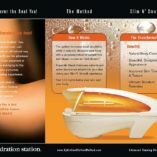 When combined with our special “dry skin brushing” techniques our clients have reported amazing results at eliminating those unwanted and unsightly wrinkles we call cellulite. Miracle Gel is also used as a skin softener. Men have found that using Miracle Gel after shaving softens their face and helps razor burn!